Fasnacht, fassenacht, faschnacht. Whichever way you choose to spell it, if you have grown up in Pennsylvania Dutch country, you have probably come across this traditional donut which makes an appearance once a year on Fasnacht Day. Here at Wanamakers General Store, fasnachts have been a part of our tradition since we re-opened in 2008. We have dozens of them arrive (sometimes still slightly warm from the fryer) a couple times every week leading up to Fasnacht Day, and they don’t last long because people have been anticipating this moment all year. The orders come rolling in, and the bags fly off the shelf almost faster than we can keep them in stock. People load up by the dozens or come in daily to enjoy one with a cup of coffee, some ship them to family who have moved out of state, while others squirrel them away in the freezer so they can enjoy them all winter long. For those of you who aren’t familiar with Fasnacht Day, you probably know it by one of its other names: Mardi Gras, Carnival, Fat Tuesday, or Shrove Tuesday. It is the day before Ash Wednesday. The word “Fasnacht” is German and roughly translates to “fasting night.” The donuts were a way to use up all the rich forbidden foods in the house before the Lenten fasting began. The fasnacht tradition was brought to this country by the German settlers who later became known as the Pennsylvania Dutch. One of the reasons that our fasnachts are so popular is because people say they taste “just the way my grandma used to make them!” They are made in Lenhartsville PA by a woman named Karen Haak. When I called Karen this year to find out when she was going to start baking, she informed me that she is retiring after this season. 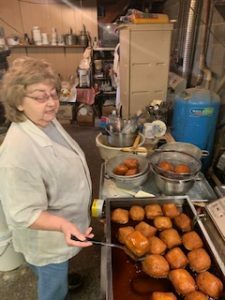 This is devastating news for us and for all the loyal Fasnacht customers who rely on that nostalgic taste of “grandma’s cooking.” As a huge thank you to Karen for filling our counter and our bellies with delicious fasnachts through the years, I set out to capture her story…. I pulled into Karen’s house on a cold snowy day. I had to use the four-wheel drive in order to get up the steep driveway, but I understand why they are willing to brave the seasonal treacherousness; the view is spectacular. The snowy rolling hills unfold into the distance, and although the day is overcast there is no denying the stunning landscape. The wind cuts across my face and I hurry towards the house. Karen meets me at the door and ushers me into her warm kitchen. She pours me a cup of coffee and we sit down at her kitchen table with a large bowl of rising dough between us. I have spoken to Karen many times over the phone throughout the past number of years, but this is the first time we have met face to face. Karen Snyder (Haak) was born and raised just down the road, in fact her current house is built on a parcel of the original family farm. Karen has two sisters and one brother. She was raised by her mom Lillian Snyder on her grandparent’s farm in Lenhartsville PA. I asked Karen if she knew when her ancestors had immigrated to the United States, she says she isn’t sure exactly, but as far back as she can track, her family has lived in the Lehigh Valley area. Lillian raised four children while working at a blouse factory in Kutztown. 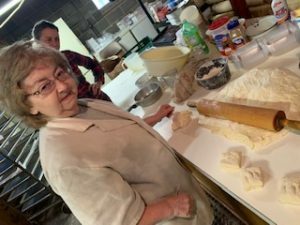 Scraping together a living for a family of five was no easy task, so Lillian began making and selling fasnachts to her coworkers at the factory to bring in some extra cash. Her skills became well known and she was quickly overwhelmed with more orders than she knew what to do with. Karen got her first job at the Skyview diner in Krumsville when she was 14 years old, she worked there until she married at eighteen, just after graduating from high school. Karen married Ronnie Haak a local man who joined the air force which took the newlyweds to Texas. From there they moved to Pittsburgh PA and Seattle Washington, before making their way back to Lenhartsville. Back in PA, the young couple began their family, which consists of four boys. While the boys were still little, Karen went back to work at the Skyview Diner, there she worked her way up to head cook and manager. When the blouse factory in Kutztown closed, Karen hired her mom to work at the Skyview, and the two of them took over the baking together. When the diner changed hands in 1988, Karen and her mom started their own business out of Karen’s home. They sold at markets (Leesport, Renningers in Kutztown, Craft shows, and flea markets), and as their reputation grew, they got orders from other local businesses such as Rabert’s Sunoco in Kempton, Lesher’s Country Cupboard in Lenhartsville, and Wanamakers General Store. 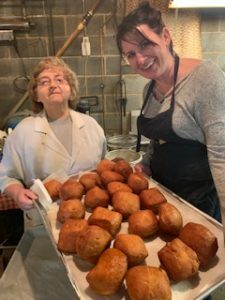 Friends and family took orders from coworkers, she baked for fire companies and church bake sales, neighbors come to pick them up by the dozens, some people even shipped them across the country to family members who were hankering for a taste of home. 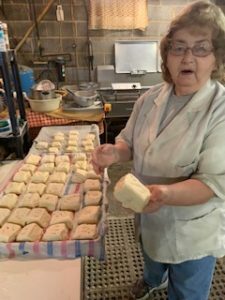 During their heyday, Karen estimates that they were making upward of 400 dozen donuts a week, along with all the other traditional PA Dutch delights. What is the farthest one of her fasnachts has traveled; all the way to Alaska. Unfortunately the customer didn’t want to pay for overnight shipping and the donuts arrived green and furry. Karen said her baking philosophy is; “like it used to be.” She keeps it traditional and she buys as much as she can locally. 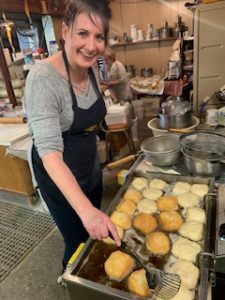 The ingredients for her baked goods are purchased from the friends and connections she has made over the years at the markets. 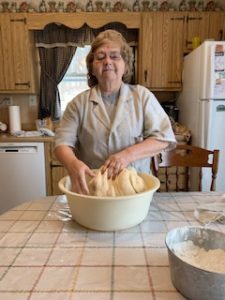 While we talk, Karen pulls the bowl of dough across the table and punches it down and kneads it before covering it with the cloth to rise again. I ask Karen about the process of making a Fasnacht. She says some people make the dough the day before and let it sit overnight, she makes her dough in the morning. “If I made it at night it would fill my whole kitchen and be all over the place by morning.” She says laughing and gesturing around the kitchen. “Besides, I have a secret….” Again, she laughs and lowers her voice confidentially. Instinctively I lean in to listen, although it’s just us in the kitchen…. Karen says that anyone can follow a recipe, but to really be successful it takes a lot of trial and error and an understanding of ingredients, the season, the temperature and most importantly the timing. If the fasnachts don’t rise long enough they will absorb too much lard and be greasy and not fluffy. Wait too long, and they will get “glutsy.” I asked Karen what “glutsy” means, and she smiles shyly and says; “oh it’s just one of those old expressions, I guess it means hard or solid.” I asked Karen about the history of fasnachts. They have been a part of her family tradition her whole life, her grandfather ate one for breakfast every morning. She also says that donuts were a way to use up the lard before the warm Spring weather turned it rancid. Soon it would be butchering time and there would be a fresh supply of lard for the season. Karen buys her lard from Dietrich’s Meats in Krumsville, which she says is the best. The dough has risen to the rim of the bowl again and Karen turns the heat on in the fryer before taking the dough out and kneading it on the counter. She slashes off a section of dough and quickly carves it up into little square pieces which are scored and placed on a large baking sheet. She offers the rolling pin to me and says, “here, you give it a try.” It’s not as easy as she made it look, my squares are inconsistent in size and I just can’t quite slice through the dough as smoothly as she can. Karen smiles as she picks up one of my misshapen attempts; “this one is too heavy,” She says, as she gently hefts it in her hand, before briskly slashing it down to the correct size. Once the baking sheet is full, the fasnaughts are put in a convection oven to rise before making their way into the vat of lard. The smell of frying quickly fills the kitchen, as the fasnachts bob around in their lard bath, gradually turning a dark golden brown. We chat some more as Karen deftly turns each fastnacht to ensure that it cooks evenly. “My mother was a doer,” she tells me. “She wasn’t much of a teacher, she just didn’t have the patience for it. I love her dearly, and she was who she was, but I had to learn a lot of this on my own. I learned from watching my mom and then figuring it out for myself.” From the fryer the faschnatchs are transferred to a strainer to drain the excess lard away before they are moved to a cookie sheet to cool. I learned a lot in that kitchen, about hard work, life, family, tradition and love. We were interrupted twice during our baking by calls from her sons checking in, making sure their parents were doing alright after the snowstorm. I think that what Karen says about baking is true. Anyone can follow a recipe, but what adds that intangible dimension of flavors comes from the life experience and love of the person kneading the dough.